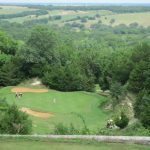 Nestled between Joe Pool Lake and the Mountain Creek Escarpment lies one of the state’s top public championship golf courses … Tangle Ridge Golf Club. 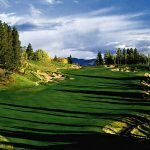 The layout has the feel of a Hill Country course with elevation changes of over fifty feet, gently rolling hills and trees guarding every hole. 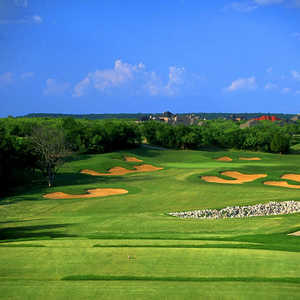 The magnificent panoramic views differentiate the course from any other in the D/FW area. The 250 acre layout is bisected by a stream which runs east-to-west along the northern portion of the property. Approximately 60 acres of tangled natural vegetation remains as construction minimized the impact to existing wetlands. 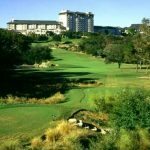 The forested areas made up of native Mesquite, Hackberry, Cedar Elm, Easter Red Cedar, Pecan and Oak trees separate the fairways giving the golfer an enjoyable feeling of isolation. Players rarely see other holes while making their way through the layout. 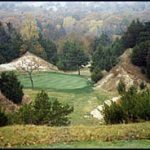 Tangle Ridge is a strategic course requiring the player to use every club and shot in his arsenal. The fairways are generous but poorly hit shots may find the native areas. 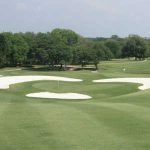 The variety of grass and sand bunkers, creek crossings, dramatic mounding, berms, doglegs, and tree-lined roughs provide plenty of challenges. The four par-five holes standout. The 545 yard fifth hole doglegs right to a slightly elevated green protected by deep bunkers. The demanding 575 yard eighth hole plays into the prevailing wind. A creek, which crosses the middle of the fairway, generally can’t be reached on the downhill tee shot without a north wind. The creek also meanders down the left side of the uphill second shot, while trees, native grasses and the driving range are on the right. While the landing area gets smaller, players will want to get as close as possible to the uphill green for their approach shots. A steep bank which drops into a pond guards the front of the green, while a cluster of trees and native grasses is on the right. The severe slopes behind the green, reminiscent of the “punch bowl style” of early American designers, may allow the ball to roll back onto the putting surface. Reaching the putting surface of the challenging par-five eighth hole is only half of the battle – two large berms divide the slick green into three sections. The green is divided into three sections by two large berms. Land in the wrong section and you’ll face a tough roller-coaster putt – and be glad to three-putt. The 501 yard par-five thirteenth hole features a downhill tee shot over rolling terrain to a dogleg left. The upper level of the left fairway allows accurate second shots to roll safely onto the semi-blind green. The finishing hole is a 521 yard par-five with a “challenge fairway.” A solid tee shot, which must carry a pond and avoid a large beach bunker, that lands safely on a small peninsula on the right will shorten the hole by about thirty yards, making the green more reachable in two. Brauer believes par three holes should be reachable for the average golfer. Indeed, the longest Tangle Ridge offers is the 189 yard seventeenth hole which is downwind and open in the front. Anything hit left is trouble. Accuracy is the key on the 152 yard ninth hole. The huge three-tiered putting surface slopes significantly from back to front. The fourth hole is the shortest, 132 yards. A ridge runs across the middle of this kidney shaped green which is protected on the front by a large bunker with an island of rough grass in the middle. Many course architects design short holes into the prevailing wind and offset this by having the long holes play downwind. “We don’t like to equalize the challenge of every hole,” said Brauer. The fun 313 yard sixth hole is usually downwind allowing many golfers to shoot for the putting surface. Anything short will likely be swallowed up by one of the large bunkers. The sixth hole is reachable from the tee, but an awkward second shot may result. Distance off the tee is a necessity to tame the 444 yard seventh and 457 yard sixteenth holes. The right side of the fairway, guarded by a cluster of bunkers, is the preferred angle into the large greens on both of these par fours. The opening shot of the day is played on a downhill, downwind par four measuring 469 yards which doglegs to the left. Fairway bunkers and a creek run along the left side. The fourteenth hole is a picturesque 384 yard par four which doglegs to the right into a green that is tucked into a grove of trees, protected by sand and grass bunkers. 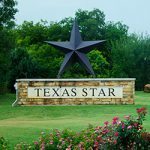 Brauer achieved the city of Grand Prairie’s goal with Tangle Ridge. 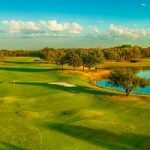 The course is definitely fun to play and the unique scenery rivals any course in the D/FW area. Tangle Ridge is a great venue for a relaxing round of golf away from the distractions of the big city and the layout lends itself to scrambles and other outings. If you haven’t had the opportunity to play the course yet, be sure to check it out!